While coming up with ideas for Super Bowl appetizers I didn’t want to make too many overly complicated dishes. It is safe to say that wings are usually the first to go at any sporting event. Most often people go to what they know first and will experiment later. That is why chicken wings are always a success. 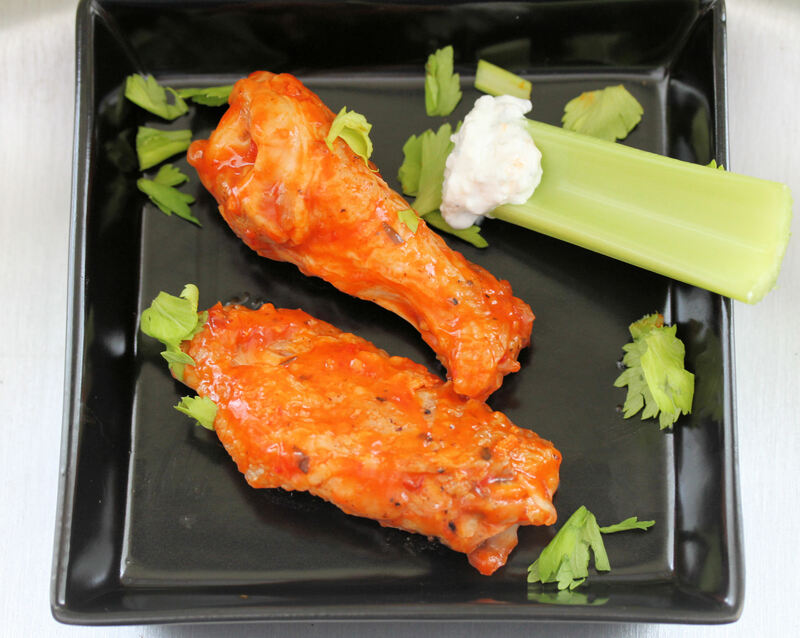 Although you can dream up numerous ways to season them, I think spicy buffalo wings with a blue cheese sauce and celery are always satisfying. For this years party, I decided to pick up some Molten sauce used by a local dive restaurant, Grinders, which was featured on Diners Drive-ins and Dives. The sauce has a sharp spice that is just a little out of the ordinary. 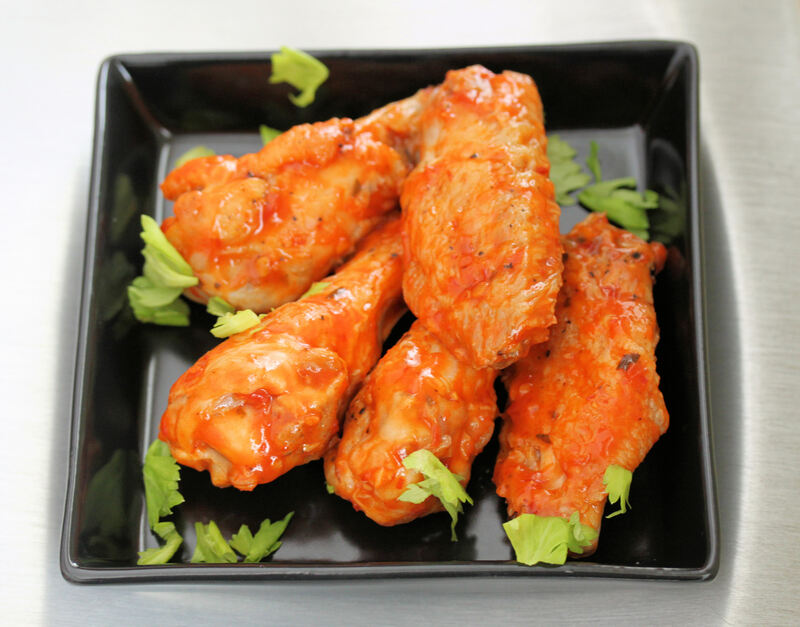 If you don’t have a favorite local wing spot, you can always use the basic buffalo wing recipe of Tobasco or Franks hot sauce with melted butter. Either way, the cooking process is extremely easy whether you bake them or grill them. 10 whole chicken wings or 20 pieces, approximately 2.5 lbs. Meanwhile, rinse and dry your chicken wings with a paper towel. You can leave your wings whole or cut them at the knuckles and discard the tips to create the traditional wing and drummette style meal. Lightly oil the wings and then add salt and pepper. Place the wings on a cookie sheet lined with aluminum foil. Place the cookie sheet in the oven and bake for 20 minutes, then turn the chicken and bake for an additional 20 minutes. In a small bowl, stir together the blue cheese and sour cream until well blended but there are still blue cheese chunks. Slice the celery and roughly chop the celery leaves for the garnish. Set aside. Remove the wings from the oven and place in a large bowl. Add the local wing sauce to the bowl and turn the chicken to coat fully. Transfer them to a serving platter and sprinkle with the celery leaves. Serve hot. 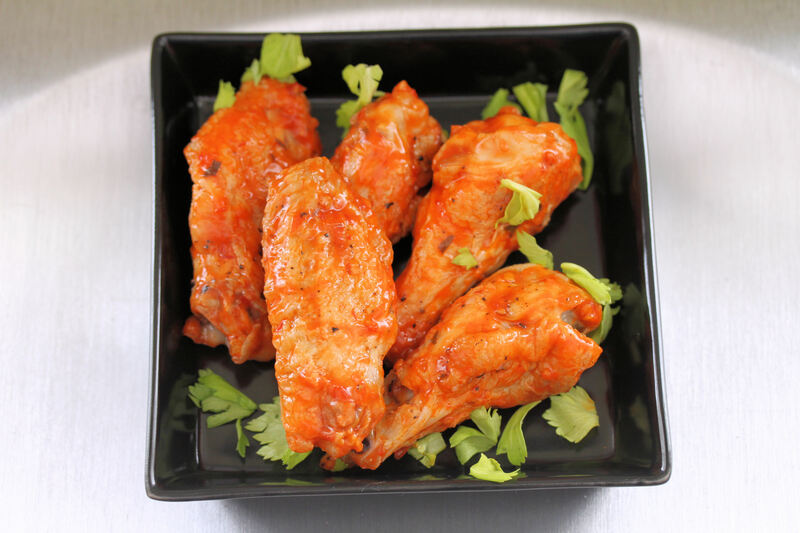 * As an alternative to baking and if the weather permits, I always prefer firing up the grill and grilling the wings over medium direct heat for about 15-20 minutes. Turn the wings so they cook evenly and do not burn. Follow the same preparation and serving process described above. This entry was posted in appetizers and dips, how to, snacks and tagged appetizers, buffalo wings, chicken wings, football food, football recipes, game day, grinders, how to make wings, molten sauce, molten wings, super bowl. Bookmark the permalink. That sauce sounds nice. Makes me wish I could acquire some to try. Oh well, Nando’s to the rescue again!